How do I purchase Dr. Seuss artworks? Did Ted Geisel (AKA Dr. Seuss) write and illustrate his book? What is the Secret Art of Dr. Seuss? How did The Art of Dr. Seuss project come to fruition? Were any Dr. Seuss fine art prints or sculptures published during his lifetime? Are these works signed by Dr. Seuss? Do these works exist in any other form? Is there a certificate of authenticity issued for these works? Are all works in the collection created in limited editions? What do the different parts of the edition mean? How are artworks in The Art of Dr. Seuss Collection produced? How do I take care of artwork that I’ve already acquired? 1. How do I purchase Dr. Seuss artworks? The Art of Dr. Seuss is available through Authorized Dr. Seuss Galleries. To find a gallery, please click here. To verify dealer status, contact us at 888.224.2731 ext. 0 or info@drseussart.com. 2. Did Ted Geisel (A.K.A. Dr. Seuss) write and illustrate his books? 3. What is the Secret Art of Dr. Seuss? The Secret Art often shows a side of the artist that most readers, familiar with him through his classic children’s books, have never seen. These fantastical images have the inimitable style of Geisel’s alter ego, Dr. Seuss, frequently depicting outlandish creatures in otherworldly settings. The Seuss humor is also evident, as well as the insight that often gave his stories deeper meaning. However, these works break new ground, using a dazzling rainbow of hues not seen in the primary-color palette of Geisel’s books for children. 4. How did The Art of Dr. Seuss project come to fruition? For over 60 years, Dr. Seuss’s illustrations brought a visual realization to his fantastic and imaginary worlds. However, his artistic talent went far beyond the printed page. Seuss always dreamed of sharing his “Secret Art” with his fans and had entrusted his wife, Audrey, to carry out his wishes once he was gone. Audrey, too, believed the work deserved further recognition and that Ted himself would some day be evaluated not only as an author, but as an artist in his own right. 5. Were any Dr. Seuss fine art prints or sculptures published during his lifetime? No. All of the original works were obviously created by Dr. Seuss during his lifetime, yet, despite the incredible demand for published Seuss artwork, no limited edition pieces were ever created until this historic project began in 1997, six years after Ted Geisel’s death. All of these limited edition artworks are authorized by Dr. Seuss Enterprises, L.P. and were made posthumously. 6. Are these works signed by Dr. Seuss? 7. Do these works exist in any other form? Yes, each work in the collection is reproduced from Dr. Seuss’s original drawings, paintings, or sculpture. In many cases the original works still exist and are archived in the Geisel Library at the University of California San Diego, or in the Geisel family’s private collection. The works held by the Geisel family have been designated for placement into a permanent public archive at the family’s discretion. Very few originals are known to have made it into the hands of private collectors, therefore the prints and sculptures included in this collection offer, in many cases, the only opportunity to collect these images. 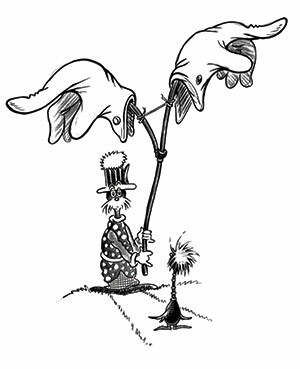 Theodor Geisel was granted the exclusive right to reproduce or distribute his images per United States copyright and trademark law. Upon his death, those exclusive rights passed to his wife, Audrey Geisel, and it is only with her permission that these works can be licensed or distributed. Although many of the images have appeared in Seuss books, advertisements, or political cartoons over the years, all of the works in The Art of Dr. Seuss collection are created in an exclusive publishing arrangement with Dr. Seuss Enterprises and Audrey Geisel, thereby assuring their authenticity and rarity. Some works may be created in more than one size and/or medium, but in each instance the materials utilized to create the works are destroyed upon completion of an edition. 8. Is there a Certificate of Authenticity issued for these works? Yes, the publisher provides a comprehensive document giving prospective collectors specific information regarding the processes used to create each Dr. Seuss piece. The Certificates of Authenticity state what the work is, how it was created, when it was made, the limits of the edition, and other pertinent information specific to each work. A sample certificate can be provided for your review prior to making an acquisition. 9. Are all works in the collection created in limited editions? Yes, these works are in extremely small editions. Recent sales figures indicate that over 600 million Dr. Seuss books have been sold to date. The Art of Dr. Seuss editions range from just 350 pieces to 2,750 per edition, leaving only a small fraction of Seuss fans with the chance to collect these graphics and sculptures. 10. What do the different parts of the edition mean? In fine art publishing an edition number represents the number of prints or sculptures made of that image, at that size and in that medium. Two numbers are written in a lower corner of a print or on the back or edge of a sculpture. The bottom number represents the total amount of pieces in that portion of that edition and the top number represents the place in the order of the edition that particular piece is. a.) Arabic Numbers represent the main portion of the edition. Most collectors who acquire an artwork from The Art of Dr. Seuss Collection will receive an Arabic numbered piece. b.) The Patron Program is designed to allow collectors the opportunity to acquire the same edition number for each Dr. Seuss release per calendar year. A separate portion of each edition is reserved for Patron collectors, numbered I/XCIX – XCIX/XCIX [1-99]. A patron collector commits to acquiring all releases from a specific year for the collection. c.) Similar to an Artist’s Proof (AP), the Collaborators’ Proof, or CP, was created in collaboration with the printer, publisher, and the Dr. Seuss Estate. This portion of the edition is reserved for special gallery exhibitions and is made available only after the Arabic edition has sold out. d.) Hors d’Commerce are those pieces that are not available for sale. They are reserved for the publisher and The Dr. Seuss Estate. 11. How are artworks in The Art of Dr. Seuss collection produced? One of the primary goals of The Art of Dr. Seuss project is to educate the public with information detailing the history of this celebrated collection. From the project’s inception in 1997, we have educated thousands of people including collectors, galleries, museums, curators, and the media with precise information designed to edify Dr. Seuss enthusiasts and sophisticated art collectors alike. Following each collection below is a link for A Guide to the New York Print and Photograph Law www.collegeart.org/guidelines/photolaw.html. This is the foundation for this collection of artworks and is considered the gold standard in the art industry. This intentionally “low-tech” method involves highly skilled artisans and master printers whose job it is to faithfully re-create Dr. Seuss’s original works by individually drawing and/or separating each color, then mixing and printing them one at a time via a plate or stone lithograph press. It can take up to three months to create each individual print utilizing this traditional printmaking method. The result is a beautifully created artwork, second only to the original itself. (Complete documentation of each print is included in the Certificate of Authenticity.) A Guide to the New York Print and Photograph Law "www.collegeart.org/guidelines/photolaw.html serves as the foundation for these reproductions and is considered the gold standard in the industry. The College Art Association (CAA) http://www.collegeart.org/ has established a set of legal and ethical guidelines for practitioners, enthusiasts, and interpreters of art. Hand-pulled serigraphy is also known as silkscreen printing. This method gained prominence in the mid-1960s when artists such as Andy Warhol took notice of silkscreen’s potential for fine art printmaking and began utilizing it to create multiple layer graphics full of bright colors and crisp detail. Like hand-pulled lithography, this intentionally “low-tech” method is usually carried out under the direction of a master printmaker who must carefully break down an original painting into its many colors, and then individually draw and/or separate, mix and print each color, one layer at a time. Many Seuss prints are so complex that it can take up to 70 individually printed colors to faithfully reproduce Dr. Seuss’s original painting. Additionally, some works in the collection employ more modern printmaking techniques not available to artists of past generations. Mediums such as giclee offer a wide range of color saturation, coupled with a delicate subtlety that lends itself well to certain works. Prints reproduced using this method capitalize on the brilliant fidelity of specially calibrated digital presses, coupled with inks and papers which were developed over many years and specifically designed for fine art printmaking. Just as silkscreen printmaking revolutionized the way artist and printmakers expressed themselves in the 1960s, so too has giclee printmaking in the early 21st century. (Complete documentation of each print is included in the Certificate of Authenticity.) A Guide to the New York Print and Photograph Law http://www.collegeart.org/guidelines/photolaw.html serves as the foundation for these reproductions and is considered the gold standard in the industry. The College Art Association (CAA) http://www.collegeart.org/ has established a set of legal and ethical guidelines for practitioners, enthusiasts, and interpreters of art. These are fine art quality prints made with archival pigment inks using an ultra high-resolution printer. These types of prints are becoming the new standard for fine art reproduction because of their longevity and exceptional quality. Pigment printing refers to use of pigments in various states to achieve brilliant and lasting work. Artists have painted with pigments for centuries with the purpose of creating fade resistant and saturated colors. .
(Complete documentation of each print is included in the Certificate of Authenticity.) A Guide to the New York Print and Photograph Law http://www.collegeart.org/guidelines/photolaw.html serves as the foundation for these reproductions and is considered the gold standard in the industry. The College Art Association (CAA) http://www.collegeart.org/ has established a set of legal and ethical guidelines for practitioners, enthusiasts, and interpreters of art. A mixed-media pigment print is created using a combination of pigment inks, specially calibrated fine art digital printers, and serigraphy. The combination of pigment inks and serigraphy is utilized to reproduce the brilliant depth and vibrancy of the original artworks. The creation of The Bronze Tribute Collection marks the first time intimate and large-scale bronze sculptures based upon Dr. Seuss’s work have ever been made available for private acquisition. These works, also available for public installation, range in size from fifteen-inch maquettes (small-scale studies) to eight-foot monumental works. Artist Leo Rijn was selected as the inaugural sculptor for this project due to his prized work with some of today’s top talent in the world of film, entertainment, and the visual arts (including work with Tim Burton and Steven Speilberg). Rijn has been identified as one of today’s brightest sculpting talents because of his ability to breathe life into the written word and successfully transform two-dimensional ideas into three-dimensional works of art. 12. How do I take care of artwork I've already acquired? Your artwork was crafted with painstaking attention to detail. With proper care your artwork will kindle your spirit and add fun to your halls and walls for years to come. Avoid Sunlight: Display your artwork away from direct sunlight or bright conditions and periodically rotate your art, within the room, in order to avoid fading. Avoid Humidity: It is advisable to display your artwork in a humidity controlled environment. High levels of humidity and/or extreme changes in humidity may cause mildew, rippling or cracking. Avoid the Fireplace: The heat and smoke generated by your fireplace can cause excessive expansion and contraction of your artwork. If you must hang your artwork above the fireplace, periodically rotate it with other pieces. Your Paper Artwork: For artwork framed with glass, spray glass cleaner, or a mixture of vinegar and water onto a soft cloth (paper towel can scratch and will leave behind fibers) and gently wipe the glass. If your artwork is framed with plexi-glass, use only plastic cleaner (glass cleaner will scratch the plexi). Never spray cleaner directly onto the surface of the glass or plexi-glass. Use a soft, dry cloth to clean the frame. Your Canvas Artwork: Clean your canvas artwork using a soft, dry cloth or a dry feather duster. Your Cast-Resin Artwork: Dust lightly using a soft, clean, lint-free cotton cloth to remove dirt and fingerprints. Your Bronze Artwork: Dust lightly using a soft, clean, lint-free cotton cloth to remove dirt and fingerprints. If the bronze surface begins to dull, and a gentle buffing does not restore the surface sheen, it is time to wax the sculpture. For more information, click here. Your Stainless Steel Artwork: If necessary, use a mild dishwashing soap to remove dirt and fingerprints. Dry with a soft cloth. Always open your artwork upon receipt in order to ensure that it has arrived without damage or defect. Your Paper Artwork: Store unframed artwork flat, not rolled or upright. It is best to use acid-free foamcore, not cardboard, to avoid yellowing, foxing, or wrinkling. Framed artwork can be stored upright. When storing more than one piece in the same area, place a piece of cardboard or foamcore between each framed artwork. Store in a cool, dry climate. Your Canvas Artwork: Store unframed artwork flat, not rolled or upright. It is best to use acid-free foam-core, not cardboard, to avoid yellowing, foxing or wrinkling. Framed artwork can be stored upright. When storing more than one piece, in the same area, place a piece of cardboard or foamcore between each framed artwork. Store in a cool, dry climate. Your Cast-Resin Artwork: As carefully as possible, return the sculpture to its original packaging and store in a cool, dry climate. Your Bronze or Stainless Steel Artwork: As carefully as possible, return the sculpture to its original packaging and store in a cool, dry climate. is not answered here, please contact your gallery or framer. You may also contact us at 888.224.2731.